Posted: September 8, 2014 | Author: Leslie | Filed under: Opportunities: Meetings | Tags: ARLIS/NA Upstate NY, Chapter Meeting | Comments Off on Chapter Meeting: ARLIS/NA Upstate NY Fall 2014 Meeting- October 3 in Saratoga Springs – Registration is open! Save the date! The ARLIS/NA Midstates Chapter is joining forces with ARLIS/NA Twin Cities and VRA Midwest for a joint conference in Madison, Wisconsin September 12-13, 2014. 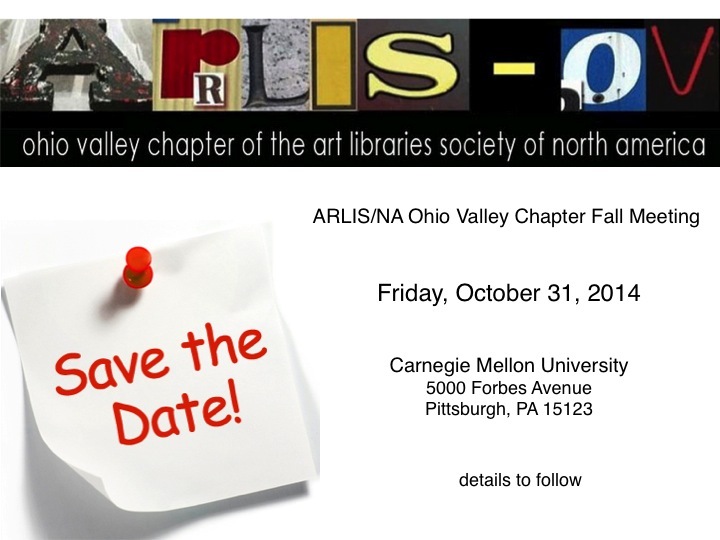 ARLIS/NA’s Ohio Valley chapter will hold our fall meeting on Friday, October 31, 2014 in Pittsburgh, Pa at Carnegie Mellon University. There will likely be Thursday afternoon/evening events as well. Please save the date! Details to come in a few months. If any of you are in Kansas City, Missouri next week, please feel free to join the ARLIS-Central Plains Chapter meeting at the Nelson-Atkins Museum, 12-14 June 2014. Our meeting theme is Community Engagement and Art Libraries. If you can join us, please notify Tracey Boswell, ARLIS-CP Chair tboswell@nelson-atkins.org . o 12:45 – 1:45 Networking Lunch at Reserved Tables, Rozzelle Court Restaurant. Bruce Hartman, director, will welcome us with a short talk addressing the museum’s strategies for engaging with the students and faculty of JCCC. Talk will be followed by unguided museum viewing. o 6:30 PM — Café Sebastienne, inside the Kemper Museum of Contemporary Art, 4420 Warwick Blvd., Kansas City, Missouri, 64111. Phone: (816) 753-5784. Kansas City Public Library, Central Library, 14 West 10th, Kansas City, Missouri, Meet in the Stanley Durwood Vault. The Kansas City Missouri Public Library was named the 2014 winner of American Library Association Excellence in Library Programming Award. The award, supported by ALA’s Cultural Communities Fund, recognizes a library that demonstrates excellence by providing programs that have community impact and respond to community needs. o Lunch afterwards, if anyone is interested downtown or Webster House (near Moshe Safdie’s bulding: the Kauffman Performing Arts Center), etc. o Explore the Museums, our Libraries, and Kansas City’s attractions on your own! Attention all Upstate NY ArLiSNAPers!